The "best" motorcycle helmet is one that provides ample motorcycle helmet safety. There are a few ways to ensure the efficiency of your motorcycle helmet. First, try out various helmets before settling on any one. 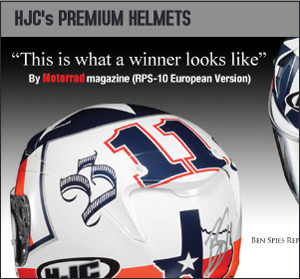 Motorcycle helmet comparison is an effective means of judging comfort, fit and security. The helmet must fit snugly around your skull--pads can augment the fit, as well. Perfect motorcycle helmet size is a key component to motorcycle helmet safety. Second, check out the chin strap. The motorcycle helmet's chin strap must reach around your ear and under your chin comfortably and securely so that the helmet does not shift about laterally or lengthwise. Third, assess the overall fit. A motorcycle helmet should be settled low on the forehead and just above the eyebrows. Make sure the helmet appears straight and aptly situated by using a mirror or a buddy. Knowing proper helmet fit is an integral step in helmet safety. If you cannot gage the right fit just by looking, visit a motorcycle specialty store whose experts can assist you in fitting. Lastly, before purchasing, be sure you're choosing a DOT approved motorcycle helmet or one that meets other standards, such as Snell certification. Founded in 1957, the Snell Memorial Foundation is a non-profit organization that researches, develops and tests helmet safety standards. Motorcycle helmet rating ensures the rider that he or she is using reliable head coverage. In addition to checking motorcycle helmet test stickers upon purchase, you may also want to peruse a motorcycle helmet review to learn about motorcycle helmet crash tests. Make an informed decision for the sake of motorcycle helmet safety.